A collection of Box-oriented objects. The arrangement of Boxes is given by the underlying BoxLayout object. BoxLayoutData attempt to prevent users from maniupulating the template class T to become out of synch with the boxes in the BoxLayout. Caveat emptor. All access to the data in a BoxLayoutData is forced to be data-parallel, by use of the DataIterator. Interval, and does not depend on the current state of the T object. can size their message buffers, but a static object cannot. In sequential codes, many of these functions will not be called, but in the general parallel case, they all will be. overridden and throws an error. References CH_TIME, and BoxLayoutData< T >::completePendingSends(). References BoxLayoutData< T >::allocateGhostVector(), CH_assert, BoxLayout::isClosed(), LayoutData< T >::m_boxLayout, and BoxLayoutData< T >::m_isdefined. Reimplemented in LevelData< T >, LevelData< EBGraph >, LevelData< NodeFArrayBox >, LevelData< CodimBox< FArrayBox > >, LevelData< BaseFab< IntVect > >, LevelData< FluxBox >, LevelData< BaseIVFAB< double > >, LevelData< BaseIFFAB< double > >, LevelData< EBCellFAB >, LevelData< EdgeDataBox >, LevelData< BaseFab< bool > >, LevelData< FArrayBox >, LevelData< BaseFab< int > >, LevelData< EBData >, and LevelData< EBFluxFAB >. References BoxLayoutData< T >::allocateGhostVector(), CH_assert, BoxLayout::isClosed(), LayoutData< T >::m_boxLayout, BoxLayoutData< T >::m_comps, and BoxLayoutData< T >::m_isdefined. Referenced by BoxLayoutData< T >::generalCopyTo(), and read(). References BoxLayoutData< T >::allocateGhostVector(), LayoutData< T >::boxLayout(), LayoutData< T >::m_boxLayout, BoxLayoutData< T >::m_comps, BoxLayoutData< T >::m_isdefined, BoxLayoutData< T >::nComp(), and BoxLayoutData< T >::setVector(). Define this BoxLayoutData to be the subset of the data in da defined by the Interval comps. References BoxLayoutData< T >::allocateGhostVector(), Interval::begin(), LayoutData< T >::boxLayout(), CH_assert, Interval::end(), MayDay::Error(), LayoutData< T >::m_boxLayout, BoxLayoutData< T >::m_comps, BoxLayoutData< T >::setVector(), and Interval::size(). Reimplemented from LayoutData< T >. Referenced by LevelDataOps< T >::assign(), LevelData< T >::copyTo(), LevelDataOps< T >::copyToZero(), LevelDataOps< T >::create(), BoxLayoutData< T >::define(), LevelData< T >::degenerate(), MultilevelLinearOp< T >::dotProduct(), VCAMRPoissonOp2::getFlux(), AMRPoissonOp::getFlux(), LevelDataOps< T >::incr(), and MergeSolver< T >::solve(). Referenced by LevelData< T >::copyTo(), LevelData< T >::exchange(), LevelData< T >::exchangeBegin(), LevelData< T >::exchangeEnd(), LevelData< T >::exchangeNoOverlap(), LevelData< T >::LevelData(), and write(). a_domain ProblemDomain that this grid and a_destGrids reside on. References Copier::define(), LayoutData< T >::m_boxLayout, and IntVect::Zero. References BoxLayoutData< T >::allocateBuffers(), CH_assert, BoxLayoutData< T >::completePendingSends(), DataFactory< T >::create(), BoxLayoutData< T >::define(), MotionItem::fromIndex, MotionItem::fromRegion, CopyIterator::LOCAL, BoxLayoutData< T >::m_buff, CopierBuffer::m_fromMe, CopierBuffer::m_toMe, CopyLDOperator< T >::op(), BoxLayoutData< T >::postReceivesToMe(), BoxLayoutData< T >::postSendsFromMe(), CopyIterator::size(), Interval::size(), MotionItem::toIndex, MotionItem::toRegion, BoxLayoutData< T >::unpackReceivesToMe_append(), and BoxLayoutData< T >::writeSendDataFromMeIntoBuffers(). Special version of generalCopyTo that performs increment-on-intersection of the destination instead of replacement. This version lets the user send in a pre-built Copier. References CH_TIME, and BoxLayoutData< T >::makeItSo(). References LayoutData< T >::box(), LayoutData< T >::dataIterator(), BoxLayoutData< T >::m_comps, LayoutData< T >::m_vector, and DataIterator::size(). References LayoutData< T >::m_callDelete, BoxLayoutData< T >::m_isdefined, LayoutData< T >::m_vector, and Vector< T >::size(). References LayoutData< T >::box(), LayoutData< T >::dataIterator(), LayoutData< T >::m_vector, and DataIterator::size(). 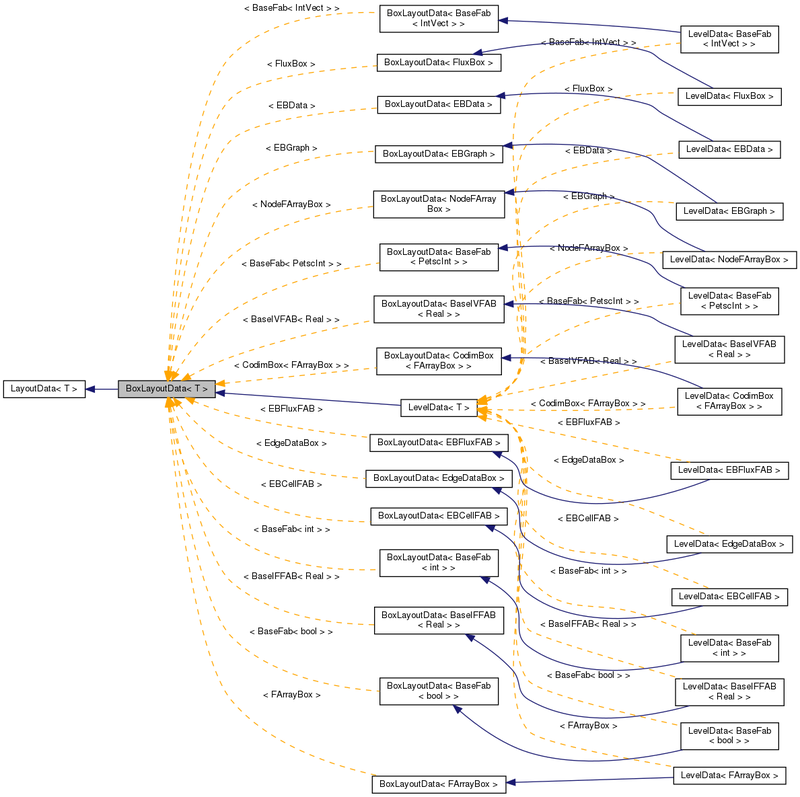 Referenced by LevelData< T >::define(), BoxLayoutData< T >::define(), and LevelData< T >::LevelData(). References LayoutData< T >::box(), DataFactory< T >::callDelete(), DataFactory< T >::create(), LayoutData< T >::dataIterator(), MayDay::Error(), Box::grow(), LayoutData< T >::m_callDelete, BoxLayoutData< T >::m_comps, LayoutData< T >::m_vector, Vector< T >::resize(), DataIterator::size(), and Vector< T >::size(). Referenced by BoxLayoutData< T >::BoxLayoutData(), LevelData< T >::define(), BoxLayoutData< T >::define(), and LevelData< T >::LevelData(). References BoxLayoutData< T >::makeItSoBegin(), BoxLayoutData< T >::makeItSoEnd(), and BoxLayoutData< T >::makeItSoLocalCopy(). Referenced by BoxLayoutData< T >::addTo(), LevelData< T >::copyTo(), and LevelData< T >::exchange(). References BoxLayoutData< T >::allocateBuffers(), CH_TIME, BoxLayoutData< T >::m_buff, CopierBuffer::m_fromMe, CopierBuffer::m_toMe, BoxLayoutData< T >::postReceivesToMe(), BoxLayoutData< T >::postSendsFromMe(), and BoxLayoutData< T >::writeSendDataFromMeIntoBuffers(). Referenced by LevelData< T >::exchangeBegin(), LevelData< T >::exchangeNoOverlap(), and BoxLayoutData< T >::makeItSo(). References CH_TIME, BoxLayoutData< T >::doingJustCopy(), BoxLayoutData< T >::makeItSoLocalCopyNoOMP(), and BoxLayoutData< T >::makeItSoLocalCopyThread(). References MotionItem::fromIndex, MotionItem::fromRegion, CopyIterator::LOCAL, LDOperator< T >::op(), CopyIterator::size(), MotionItem::toIndex, and MotionItem::toRegion. Referenced by BoxLayoutData< T >::makeItSoLocalCopy(). References BoxLayoutData< T >::completePendingSends(), and BoxLayoutData< T >::unpackReceivesToMe(). Referenced by LevelData< T >::exchangeEnd(), LevelData< T >::exchangeNoOverlap(), and BoxLayoutData< T >::makeItSo(). Referenced by BoxLayoutData< T >::generalCopyTo(), BoxLayoutData< T >::makeItSoEnd(), and BoxLayoutData< T >::~BoxLayoutData(). Referenced by BoxLayoutData< T >::generalCopyTo(), and BoxLayoutData< T >::makeItSoBegin(). Referenced by BoxLayoutData< T >::makeItSoEnd(). Referenced by BoxLayoutData< T >::generalCopyTo(). Referenced by BoxLayoutData< T >::allocateGhostVector(), LevelData< T >::apply(), BoxLayoutData< T >::apply(), LevelData< T >::define(), BoxLayoutData< T >::define(), BoxLayoutData< EBFluxFAB >::interval(), LevelData< T >::LevelData(), and BoxLayoutData< EBFluxFAB >::nComp(). Referenced by BoxLayoutData< T >::BoxLayoutData(), BoxLayoutData< T >::clear(), LevelData< T >::define(), BoxLayoutData< T >::define(), BoxLayoutData< T >::isDefined(), and LevelData< T >::LevelData().